Traditional Cajun dance music, driving two steps and haunting waltzes with vocals in Cajun French. Squeeze Bayou is one of the Washington D.C area's prime suppliers of Cajun music. In 1998 the Cajun French Music Association of Lafayette, La. awarded Squeeze Bayou the prestigous "Prix Dehors de Nous" award for Steppin' Fast. The "Prix Dehors de Nous" award is awarded each year for the best recording of the year by a Cajun band outside of Louisiana. 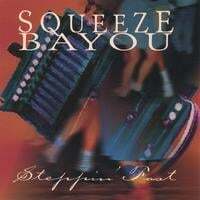 LIKE THE GREAT Cajun band Beausoleil, Squeeze Bayou knows good thing when it hears it. Both bands draw inspiration from the tradition wellsprings of Cajun music and the classic repertoires of Dennis McGee, Dewey Balfa and Canray Fontenot. As a result, Squeeze Bayou's new album, "Steppin' Fast," has its share of rhythmically engaging tunes that were, oddly enough, inspired by heartache and hard times. Fortunately, Karen Collins is wonderfully adept at conjuring up both the soiree and the sorrow implicit in the music, evoking the former with her lively fiddle and the latter with her lovely, poignant soprano. The quartet and its guests occasionally expand on acoustic Cajun music, even briefly adding a pedal steel guitar to Balfa's romantic waltz "Jaimerais te Pardonner." But the album' s focus is tight enough to please most folks who prefer to hear two-steps and waltzes the old-fashioned way. Besides Collins, by far the band's most distinctive asset, the album highlights a fine accordionist, Kevin Bell. His playing on the infectious title track exemplifies the ensemble's dance hall appeal, and during the more quaint performances, such as "Grandma's Waltz," he sensitively complements Collins's striking voice.